10th Berlin Biennale: if ‘we don’t need another hero’, what do we need? Viewing single post of blog 10th Berlin Biennale: if ‘we don’t need another hero’, what do we need? The 10th Berlin Biennale for Contemporary Art, titled We don’t need another heroafter the Tina Turner song, puts itself forward as “…a conversation with artists and contributors who think and act beyond art as they confront the incessant anxieties perpetuated by a willful disregard for complex subjectivities.” Biennale’s are always full of promise and a good way to learn about what are the sensibilities of art right now. Unfortunately the prospect of the curatorial proposal was more exciting than the overall result. The disappointment being that the biennale never seemed to take off from the ground on which it seemed happy to rest. Most of the works did not confront, surprise, or offer any of the transformative qualities that “thinking and acting beyond art” might imply. 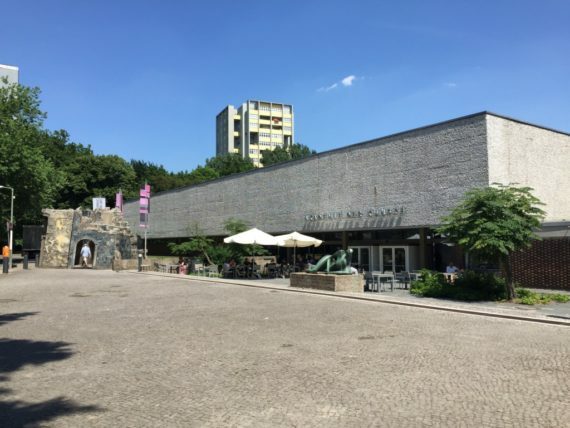 The context of many of the works seemed to get lost in what was a very conventional and conservative approach to curating, of which the exhibition at the Akademie der Künste seemed to suffer the most. The ZK/U – Center for Art and Urbanistics was a better venue in terms of its history and location, however, the work was also quite disappointing. The works either looked poorly made/installed and lacking any semantics, or had an all-too-obvious politics to it that came across as didactic. There was nothing in between that left much for me as a viewer to imagine or relate to. The saving grace of the biennale did appear in the KW Institute for Contemporary Art. There were two works that really nailed it, and in my opinion lived up to the challenge of the curatorial proposition. They were Dineo Seshee Bopape’s Untitled (Of Occult instability) [Feelings] (2016–18), and Okwui Okpokwasili’s Sitting on a Man’s Head (2018). In the central room of the KW, I entered a large orange-tinted room full of scattered rubble and wreckage. A sound piece echoed throughout in what sounded like the intermittent falling of a stone. Framed on the wall, a napkin with a playlist written on it. Towards the back you could hear the sound from a video of Nina Simone performing “Feelings” in 1976. And overlooking it all a large ball made of cardboard that hovers over the space like the Sun. 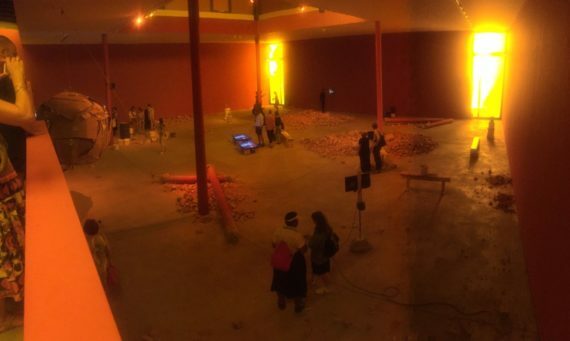 Perhaps the most interesting decision of the installation, Bopape had invited three artists—Jabu Arnell, Lachell Workman, and Robert Rhee—to include each of their works in the installation. The installation was atmospheric, and an intelligently composed reflection of what moments can we excavate in the ruins. The other work that captured me was Okwui Okpokwasili’s installation and performance Sitting on a Man’s Head (2018). Covering the wall leading the way to the installation were sheets of notebook paper pinned up. Spending some time reading the contents (written by what seemed to be several different people), the viewer can uncover what seems like a number of questions (and answers) relating to themes of emotional experience and self-care. 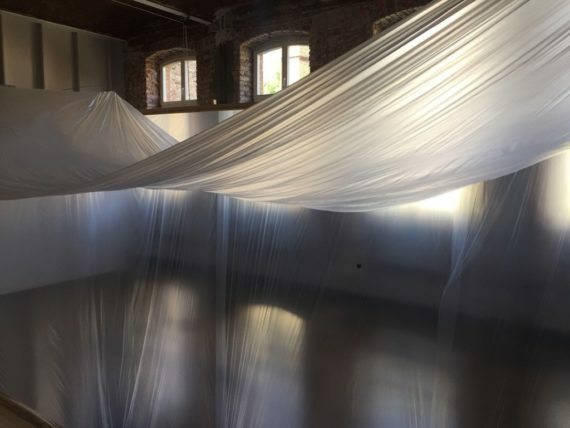 After passing these very personal and sometimes heavy reflections, there is an empty room covered in thin sheets of plastic from ceiling to floor. To enter you must remove your shoes, which I did. The whole room had this feeling of moving and breathing, the plastic rippling with the air created by the passing of people’s bodies on both the outside and inside of the room. It was entrancing, and offered a meditative experience to the viewer. Leaving the room, I was told by the invigilator there would be a participatory performance later that afternoon. Even though I’m skeptical about participatory performances, out of curiosity I returned later. In the room there are 4-5 performers who facilitate the space. Greeted by one of the performers outside the space, they ask three questions similar to the ones written on the wall. This is used by the performer to bring into the space with the participant, to whom they give a movement and a word or phrase to say in the space. The most interesting element of the work for me was how after a while the movement and spoken material begins to pass on to the others even when everyone has begun with something else. 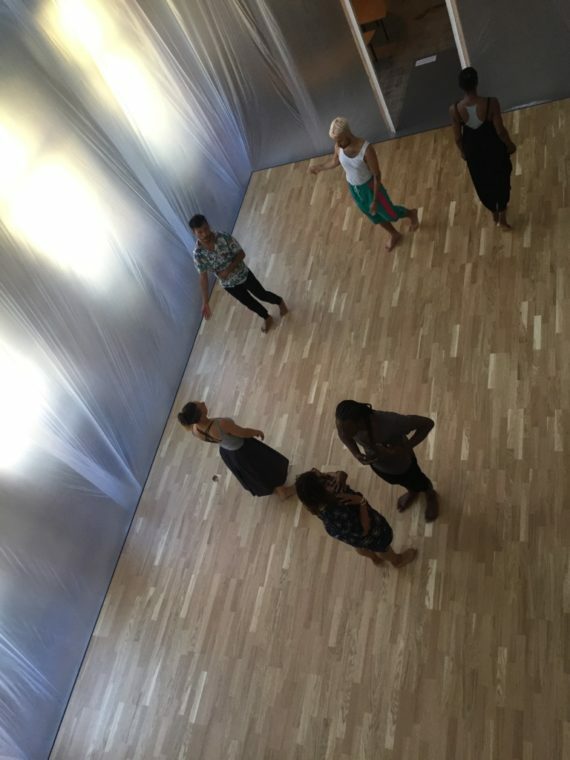 There’s an amazing collectivity that emerges through the space of the performance as it unfolds. Finding only two works in the whole biennale that excited me was too few to call the biennale as a whole a success. Gaby Ngcobo and her curatorial team are quick to declare what they don’t want to say or do, however, this leaves a gap in understanding what it is they DO want to say or do with the biennale. They say they “are interested in different configurations of knowledge and power that enable contradictions and complications,” but don’t do much to unpack what that means through the entirety of the biennale. I don’t think a few works that succeed in doing that can uphold the curatorial ambition; it seems accidental that they do if anything. So if we don’t need another hero, then I ask: what do we need? Dineo Seshee Bopape. Untitled (Of Occult instability) [Feelings] (2016–18). Okwui Okpokwasili. Sitting on a Man’s Head (2018).